Masters emphasis in Rehabilitation homepage. The Clinical Rehabilitation and Mental Health Counseling (60 credits) emphasis in the Counselor Education (M.Ed.) Master’s Program at Penn State has a dual accreditation from the Council for Accreditation of Counseling and Related Professions (CACREP) in both Clinical Rehabilitation and Clinical Mental Health Counseling. This emphasis prepares professionals to work with people with chronic illness, mental health and/or other disabling conditions (sensory disability, traumatic brain injury, amputation, substance abuse, developmental disability, physical disability) in a variety of government agencies (e.g., state vocational rehabilitation, Veterans Administration, state corrections facilities) as well as a range of community settings (e.g., non-profit rehabilitation agencies, hospital settings, substance abuse clinics, corrections re-entry programs, nursing homes and services for individuals with developmental disabilities. As one of the earliest rehabilitation counseling programs which started in 1958, Penn State has a distinguished history of producing a well-trained workforce serving people with disabilities. We have consistently been ranked as one of the top programs in the nation and, according to the most recent survey by U.S. News & World Report, our program is ranked 6th nationally with 5 faculty members with expertise in rehabilitation who have won national awards for their teaching, research and service to the profession. See below for funding opportunities. 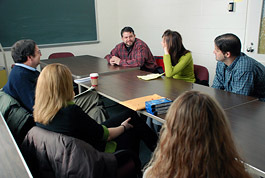 Provide didactic and clinical experiences that prepare students to implement a wide range of interventions to improve the functional, psychological, social and vocational outcomes for people with chronic illness, mental health and/or other disabling conditions (sensory disability, traumatic brain injury, amputation, substance abuse, developmental disability, physical disability). Provide students with the opportunity to specialize in a range of counseling settings (e.g., non-profit rehabilitation, state-federal vocational rehabilitation, veterans rehabilitation, bureau of blindness and visual services, psychiatric rehabilitation, private-for-profit rehabilitation, substance abuse/addictions, hospital, private practice, mental health clinics, nursing homes/gerontology, university disability services, and rehabilitation in correctional settings – prison, community re-entry programs). Prepare counselors to develop effective advocacy skills and provide preventative and developmental strategies to address barriers in the physical and social environment that can limit the civil and human rights of their clients. Holistic development of individuals with chronic illness, mental health and/or other disabling conditions with a primary focus on empowering individuals to select and implement life goals that are congruent with individual values, beliefs, and lifestyles. Understanding the medical aspects of living with a range of chronic illness and disability, and the inter-relationship between physical and mental health that can influence case conceptualization, counseling goals, and selected interventions. Client assessment, planning, and service delivery that includes synthesis of all major areas of client information; rehabilitation plan development; knowledge of service delivery; identification of community resources; and vocational assessment. Exploring psychological, social, and cultural factors that can impact client outcomes and development of multicultural clinical and advocacy skills needed to improved outcomes. Incorporating counseling theory, skills and techniques into experiential learning modes including role-play and genuine counseling situations through a supervised practicum at the Herr Clinic and supervised internship in a counseling setting related to the student's primary interest area. Click here for a sample curricula sheet. Penn State has received a Long-term Training Grant Award from the Rehabilitation Services Administration (RSA) to support master’s level training of persons interested in working as rehabilitation counselors in the state vocational rehabilitation (VR) system or other non-profit settings serving VR client referrals. Once accepted into the program, students can apply to become an RSA Scholar to help fund graduate school. This scholarship provides $22,500 for the first year of graduate school. Students can also apply for a paid internship with the PA Office of Vocational Rehabilitation in their last semester. These funds can significantly reduce the cost of pursuing our program while also providing immediate job placement following completion of the internship. International students are not eligible for this funding and cannot gain employment within the state vocational rehabilitation services system. Students are also eligible to apply for funds from the Ralph and Pat Pacinelli Endowment.